The operation "Northern Shield" was launched with great fanfare by the Israeli occupier on December 4, allegedly aimed at "exposing and neutralizing the cross-border attack tunnels that Hezbollah dug from Lebanon to Israel". Indeed, the Lebanese Resistance has repeatedly promised to no longer be on a defensive position in case of aggression or war, and carry the fighting inside occupied Palestine, or even to liberate Galilee. Spokesmen of the Israeli government ostensibly congratulated themselves on what they presented as thwarting the plans of the dreaded Hassan Nasrallah. Israeli propaganda and its docile Western media relays presented the operation as a large-scale military offensive that would strike a huge blow to the Party of God, as if the Zionist entity had entered Lebanese territory (or was about to do so), whether on land or underground. A speech by the Hezbollah Secretary General was announced for the same day by the Israeli and Western media, which would have seemed to confirm the importance of the Israeli operation. And given Hezbollah's silence, it was ultimately said that this silence was due to the shock in which the Lebanese Resistance found itself after this surprise operation that would have ruined its most secret plans. But what is it all really about? First and foremost, it is ridiculous to equate drilling and excavation work taking place inside occupied Palestine, and not encroaching in any way on Lebanese territory, with some kind of offensive, or even a military operation. Heavy construction, earthworks and fortification work on the northern border of Israel have been conducted by the IDF since 2015, with the aim of creating a Maginot-kind line of defense against Hezbollah (to emphasize its anachronistic character, Al-Manar nicknamed it The Wall of Illusion). When Hezbollah intervenes in the war in Syria, and fights as a very large formation, and with very different armaments, or as part of a very large formation with various armaments, and participates in major and very extensive offensive operations, when he manages to repel armed men (ISIS terrorists), who are not normal combatants, especially foreigners, fighters of such a level (of commitment, ready to die), when Hezbollah expels them from very large geographical areas, it means that Hezbollah gains an offensive experience, a vast experience of liberation of territory through continuous and direct military operations, and not through guerrilla warfare. And Hezbollah did not have such experience before the war in Syria. This is where Israel is frightened and terrified. Because what Hezbollah does in Syria, if a war is launched against it, it will do it in Galilee. [...] If Hezbollah emerged from the (2006) July war as a regional power, it will emerge from this war (in Syria) as a true military power representing a force capable to liberate (huge) territories not only through guerrilla warfare, but even in a war that looks much more like the classic wars (between national armies). Hezbollah is not Hamas, and believing that their strategies and tactics are the same while their abilities and experiences are immeasurable is both an illusion and a hoax to which, of course, Hassan Nasrallah did not deign reply. We are not now in a situation where our soldiers are behind enemy lines. We are talking about engineering activity within the sovereign territory of the state of Israel. Netanyahu is blowing the incident out of proportion. He made a defensive engineering event into a dramatic military operation. This was done for one of two reasons -- either the Prime Minister is himself panicking, or he wants to sow panic to justify his actions both in delaying elections and abandoning the residents of southern Israel [against the rockets of Gaza]. But we must not rely on the Western media to bring to our knowledge this easily accessible data. For them, only the official Israeli propaganda is worthy of credit. More weak than ever, Netanyahu wants to present himself as a strong man against Hezbollah, but the operation launched against alleged tunnels, a preposterous maneuver to divert the attention of the Israeli press and public opinion, reveals only the powerlessness of Israel against the Party of God. Hezbollah is well aware that Netanyahu will not dare to launch a war of aggression against Lebanon, and that against Hezbollah, Israel has no other recourse than Washington's sanctions and its own appeals to international institutions –these same institutions and laws trampled on by Tel Aviv for decades– to condemn the alleged violations of Israeli sovereignty by Hezbollah –while Israel continues to violate Lebanese airspace daily– and take action against him. In the face of such childishness –the Israeli army is more likely to find Digletts and other underground Pokemon than operational tunnels of Hezbollah–, Hassan Nasrallah was wary not to provide any fuel to Netanyahu's show: any speech on his part would have added credibility to this hyped pseudo-operation. Hezbollah media and Lebanese civilians took care of responding, widely ridiculing the operation, mocking Israel on social media, and picnicking with family on the border to taunt Israeli soldiers on the war footing. A clip called "We'll meet up in Haifa", subtitled in Hebrew, was directed by a Lebanese artist, parody of a famous Israeli song celebrating the Balfour Declaration. Hezbollah fighters can be seen reaching Haifa by tunnel, and spying on Netanyahu in his own home. 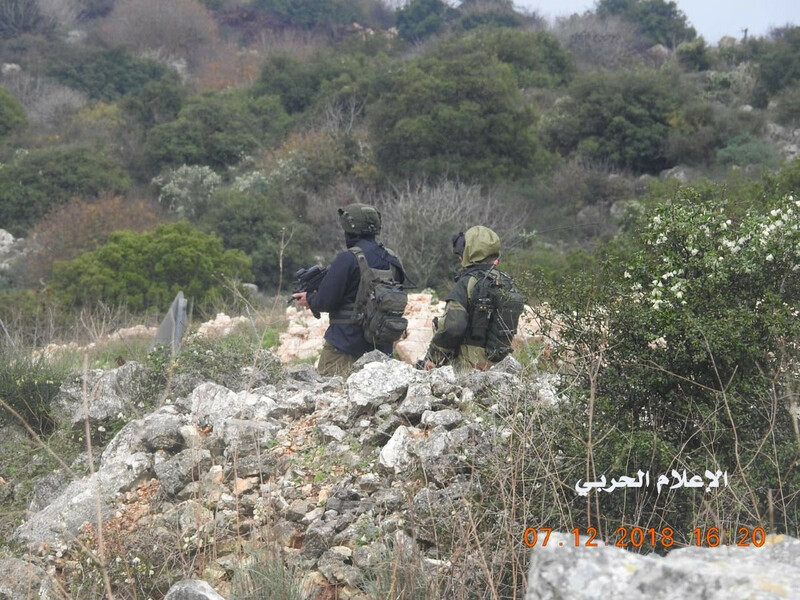 For its part, Hezbollah's war media published a picture of Israeli troops taken from behind, inside Israeli territory, while they were facing the Lebanese border, thus proving that even when the enemy is on high alert, its territory remains easily accessible. Moreover, Hezbollah fighters have stolen two FN MAG machine guns under the noses of Israeli soldiers (the Israeli media have widely reported this theft), weapons that will certainly reappear in their hands at the most opportune moment to humiliate the Israeli army and its government. And on December 12, Hezbollah released this video subtitled in Hebrew and recalling the reality of the situation: it is Israel that fears Hezbollah and takes all measures to guard against it, not the other way around. It is unlikely that the confrontation between Israel and Hezbollah will turn into war in the near future. But psychological warfare continues to rage, and the electronic battalions of Hassan Nasrallah demonstrate day after day their superiority.